That song has been stuck in my head for months because that’s a question I’ve been asking myself for months. The lease for our apartment was nearing an end and it was time to make the yearly decision of whether we should renew or find a new place to live. For the past five years the decision was much easier –stay. We had no reason to leave and felt quite comfortable and in love with the little home we’ve made here. This time the decision didn’t come so easy. The reason is mostly because the latter half of last year threw some financial, emotional, and physical blows our way and some changed our lives forever. The most devastating and impactful was when our dog Pandie was attacked by another dog and subsequently traumatized and left permanently blind. That one moment changed all of our lives. For the past 6 months we have been dealing with numerous veterinary bills and visits, sleepless nights, and often times being stuck at home because Pandie’s trauma induced separation anxiety has prevented us from going out (dogless) for more than an hour at a time. I’ve had my dogs for 15 years, that’s half of my life, and they are like children to us. I would consider myself a pretty strong and adaptable person, but my dogs are my weak spot and going through all of this has been extremely heartbreaking. Even little things like no longer being able to watch Pandie race around the apartment with her brother like she used to, or even find her water bowl on her own, still breaks my heart. All of that along with the other crap life decided to throw at us lead me to the idea of a fresh start. We had too many memories of our old way of life here, so we thought that maybe moving to a new place to start our new way of life would help with the emotions that we were feeling at the time. Plus being cooped up here started to feel a little bit like that movie ‘Room’. “Hello, sink. Hello, door. Hello, egg snake.” I’m grateful that my husband and I are able to work from home, but it was starting to get a little maddening. Although things were finally getting better, we still wanted some new scenery and were in total reset mode. “Let’s just move!”, we said. At first I was really excited! I had already been looking online periodically and felt confident that we would easily find something we loved. But something I forgot about LA is that the rental market is a jungle. By the time you even get to view an apartment and make your decision, someone else has already swept in behind you with a holding deposit in hand. Oh God, don’t get me started on DEPOSITS. A $6,000 deposit to move in PLUS first month’s rent. That’s highway robbery. Finally after a few weeks of seriously searching, we found what we thought was the one. It had all of the things we wish we had in our current apartment, and none of the things that were on our “absolutely not” list. It had just been completely renovated with brand new everything and was shiny and bright. I loved it. I was ready to sign on the dotted line and pack my boxes that day. (You may have seen my excitement on Instagram.) But, then the more we talked about it the more we started realizing that while it had all of the things that we desired, it lacked a lot of things that we required. It had a bright brand new kitchen, but there was a serious lack of storage. The bathroom was lovely and had pretty white tile and marble floors, but it had even more of a lack of storage. In-unit washer and dryer!…in the closet leaving no room for (you guessed it) STORAGE. There was also no grass in sight for our dogs’ frequent potty trips (they’re 15, this is IMPORTANT). We would also have to sacrifice location. Right now we’re located in a great area that is walking distance from everything we need. Markets, restaurants, everything is a few steps away. That was not the case at our potential new home. Time was up and we had to make our final decision. Do we stay or do we go? After weighing the pros and cons we decided to stay. We have everything we need here, we have great neighbors, lots of storage, and we’re near everything we like. Pandie has even started to learn her way around again! Things are looking up. Despite of everything this is still our home and I’m grateful to have it. This is actually the longest I’ve ever lived in one place in my entire life. I just realized that! I’m sure there’s a life lesson to be learned in all this. I’m still in need of a fresh start, but instead of starting over somewhere else, I’m just starting over in the place I already have. Hopefully redecorating does the trick! 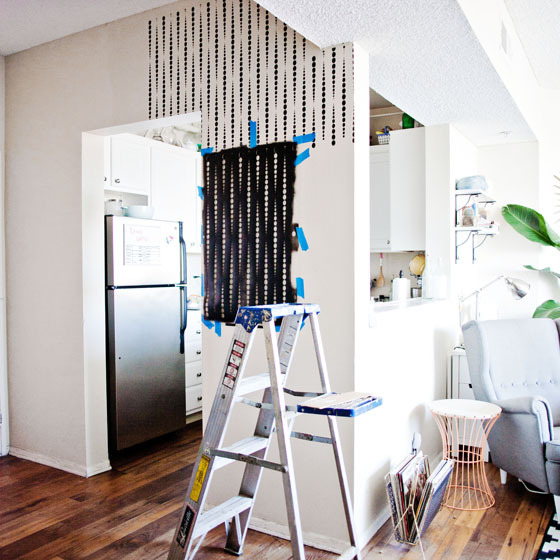 Make sure you stay tuned for lots of new (rental-friendly) home decor projects. Be sure to follow on Instagram too! I’d grown really bored of having plain greige walls in my dining room for awhile now and wanted to add something a little more interesting to the small space. First, I painted my front door a bright shade of coral, but that just made the actual walls feel even more boring. Since I rent and can’t exactly put up wallpaper, so I had to rely on paint or decals. 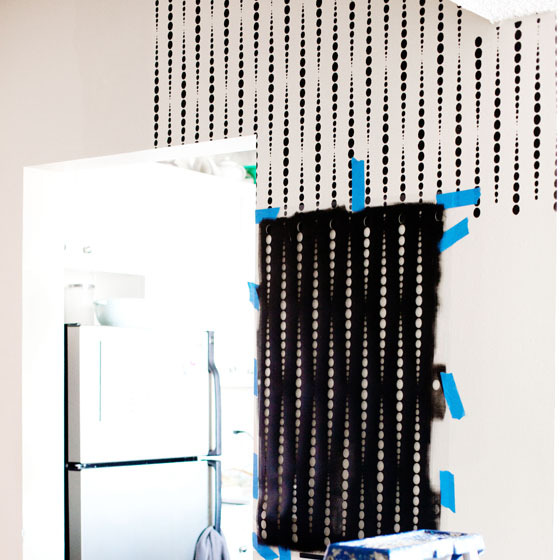 I didn’t want to paint the entire room a different color so I decided to try stenciling. I had trouble finding a design that suited my style, until I found Cutting Edge Stencils. It was hard to choose, but I went with the Beads Allover pattern. It has the mid-century vibe that I needed to pull together the style of my home. I could have gotten fancy with different colors of paint, but I just went with standard black so the rest of the colors I plan on bringing into the room will pop. I was nervous, but I’m happy to report that these stencils are amazing and easy to use. You just tape the stencil to the wall and roll your paint right over it. 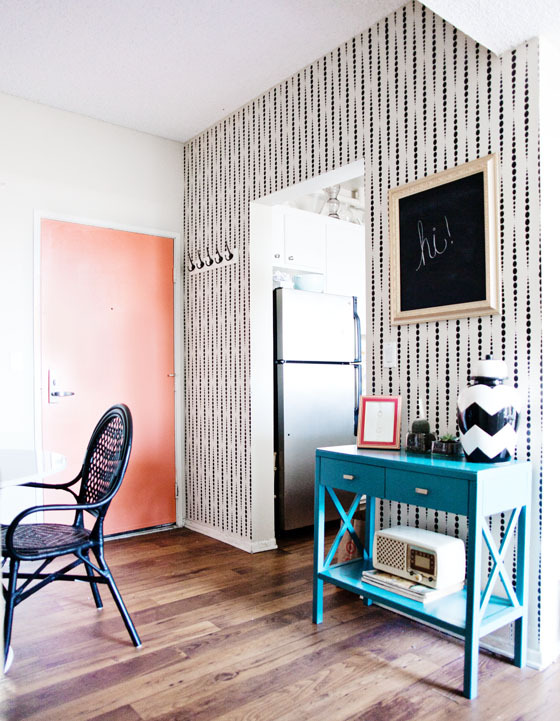 You can the look of wallpaper, but the ease of being able to just paint right over it. I was done in a jiffy! No more boring wall. Tada! I love it so much I’ve decided to continue it all around the room! Stay tuned for part 2 of my stenciling extravaganza.